What Makes a Great Sofa Bed? Users of this website should do so at their own risk. This website has been created by Avery Boardman (“we”, “us”, or “our”) and may be used for information purposes only. No part of the information on this website can be redistributed, copied or reproduced for commercial or non-personal use without the prior written consent of Avery Boardman. This copyright notice applies to all proprietary pages, images, text, programs and other material available throughout this website. All materials posted on this website are subject to copyrights owned by Avery Boardman or licensed to Avery Boardman for use by other individuals or entities. Any copy of all or part of any text or other intellectual property found on this site is expressly prohibited, unless Avery Boardman or the copyright owner of the material has expressly granted its prior written consent to reproduce, retransmit or republish the material. All other rights reserved. Unless otherwise noted, product names, brands, designs, logos, titles, or other source identifiers within this site are the trademarks, service marks, trade names or other property of Avery Boardman. All other marks are the property of their respective owners. 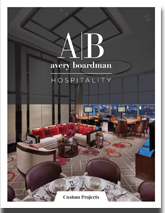 Any use or reproduction of Avery Boardman trademarks, service marks, trade names or close approximations thereof without the express written consent of Avery Boardman is prohibited. This site is provided “as is” without warranties of any kind, either expressed or implied, including but not limited to the implied warranties of merchantability, fitness for a particular purpose or non-infringement. Although the Avery Boardman site includes links providing direct access to other websites, Avery Boardman takes no responsibility for the content or information contained on those other sites and does not exert any editorial or other control over those sites. This website was developed in the United States of America in accordance with laws of the United States of America. Laws of the United States of America shall govern the use of this site. Avery Boardman does not claim that the website or the content and features on the website are appropriate or may be used outside of the United States of America. Access to the website by certain persons or in certain countries may not be lawful, and any such access or use from outside of the United States of America is at your own risk and is subject to the laws of your jurisdiction. We respect your personal privacy and will use reasonable efforts to ensure that the information you submit to the website remains private and, except as set forth herein, is used only for the purposes outlined within the website. Avery Boardman tracks and collects general information regarding the use of this website. Information included in Google Analytics, such as which pages are visited, the length of time visitors stay on the website, and the browser visitors use is collected in aggregate and not applied to specific visitors. Such aggregate information may be shared to help us determine how the website is used and what can be done to make it more useful. Avery Boardman has commercially reasonable security measures in place to protect the personal information you submit to the website. To prevent unauthorized access, maintain data accuracy, and ensure the correct use of personal information, we maintain physical, electronic, and managerial procedures to safeguard and secure the information and data stored on our systems. While no computer system or server is completely secure, we believe the measures we implement reduce security problems. Notwithstanding the foregoing, Avery Boardman cannot guarantee the security of your personal information. When you communicate with Avery Boardman electronically or otherwise submit your personal information, your communication is not necessarily secure and is subject to all of the risks of communication, such as unauthorized entry or use, hardware or software failure, and other factors that may compromise the security of personal information at any time. Avery Boardman assumes no responsibility for the security of any personal information you submit. Avery Boardman reserves the right to update or otherwise alter our security practices if and when we deem appropriate. In no event shall Avery Boardman or any of its affiliates, or the officers, directors, employees, members or agents of each of them, be liable for any damages of any kind, including without limitation any direct, special, incidental, indirect or consequential damages, whether or not advised of the possibility of such damages and on any theory of liability whatsoever arising out of or in connection with the use or performance of this website.